Next year is officially the 25th anniversary of Hellboy, and creator Mike Mignola, as well as publisher Dark Horse Comics, intend to celebrate the momentous occasion in style. They have officially announced the first ever Hellboy Day, set for March 23, 2019, a holiday dedicated to celebrating the big red hell-spawned hero's legacy. Mignola had this to say about the announcement in a statement. "When I created Hellboy way back when, I never imagined he would be around long enough to celebrate a 25th anniversary. I'm grateful to the writers, artists, colorists and letterers who have joined me in telling Hellboy stories or all these years. And, of course, so grateful to the fans. This thing could not exist without their support, and it's a pleasure every time I get to go out to meet them." Dark Horse Comics will be doing several things to make Hellboy Day worth marking down in fans' calendars. They will be republishing the character's first ever full comic book appearance, Seed of Destruction #1, which will feature a new cover from Mike Mignola and his longtime collaborator Dave Stewart. Mignola is also scheduled to appear at a signing at Earth 2 Comics in Sherman Oaks, California on the first edition of this newly minted day of celebration. In addition, Dark Horse is offering various promotional material for retailers. This includes a tattoo sheet, a Right Hand of Doom bookmark, window cling, a Hellboy open/close store sign. Plus, they're bringing up a new version of the "Mignolaverse" timeline, which recently debuted at New York Comic Con. To top it all off, the publisher is offering promotional pricing on its back catalog of Hellboy titles. Stores that participate will be entered in a drawing for prizes from Dark Horse. The timing of the event is rather convenient. 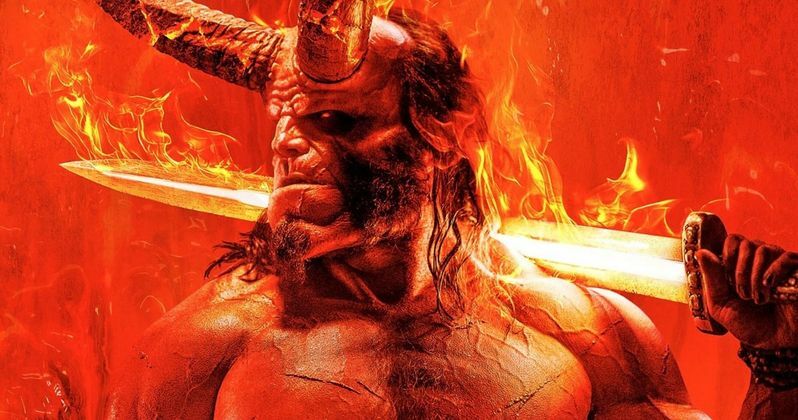 The new Hellboy reboot, which comes from director Neil Marshall (The Descent) and stars David Harbour (Stranger Things) as the titular character, is set to hit theaters just a few weeks after Hellboy Day on April 12, 2019. This could serve as a nice way to get a last-second promotional boost for the movie, which is being eyed as a hopeful start to a brand new franchise. Hellboy was first introduced to the world in 1993 in the pages of San Diego Comic-Con Comics #2 before getting his own series in 1994. A decade later, director Guillermo del Toro would bring the character to the big screen with a live-action Hellboy movie, which was followed up by the 2008 sequel, Hellboy II: The Golden Army. Unfortunately, Guillermo del Toro never got to finish up his trilogy, but his movies, with the help or Ron Perlman's portrayal, did help bring the character to the masses. Next year's reboot will finally bring him into the modern comic book movie landscape. Dark Horse has also released a poster for Hellboy day, which you can check out below. This news originated with The Hollywood Reporter.